Yesterday morning the People’s Bank of China (PBoC) surprised everyone by announcing a change to the way it was going to calculate the daily fixing rate for the Yuan (CNY). They said that the fixing would be more market-determined. More on that below, but for those unfamiliar with the exchange rate regime in China, the currency is pegged to the USD, with the PBoC each day announcing the fixing for the peg. The currency is then able to trade (onshore) freely within a band of +/- 2% of that fixing. Over recent years the PBoC has incrementally moved the fix lower (ie an appreciation of CNY), but in a very slow-moving way. For long periods the CNY rate traded at the bottom of the band, as capital inflows put upward pressure on the currency. However, since early 2014, and following a widening in the trading band, intervention by the PBoC and a reversal in capital flows, CNY has tended to trade on the weaker side of the fixing. The chart below shows the deviation of the CNY rate to the daily fixing, where a positive (negative) number indicates a weaker (stronger) rate. Prior to the policy action yesterday, CNY was trading around 1.5% weaker than the fixing. Following repeated statements from the PBoC and Central Council, there was an expectation that the trading band would be widened further in the near future, as China slowly moved towards a more market-determined exchange rate. However, the surprise move from the PBoC was to announce that the daily fixing would now reflect the previous days closing price for CNY, as well as a bit of woolly language around demand and supply and other exchange rate moves around the world. As such, the new fixing was shifted by around 1.5% yesterday (ie moving it in line with the previous days CNY close), the largest one-day move in over 20 years, and reversing all of the appreciation against the dollar since 2013. The CNY rate fell further, and just as they had done yesterday, the PBoC announced the new fixing rate this morning in line with yesterday’s CNY close (ie down another 1.5%). An enormous amount of ink has already been spilt on what this all means. Why did the PBoC decide to do this now? August markets are the least liquid and therefore prone to outsized responses to surprises. Was it part of the plan for the PBoC to get CNY included in the IMF’s SDR basket (for which they needed to demonstrate a more flexible exchange rate regime)? Or was it a signal that the economic woes in China are far worse than those outside thought, and this is just another weapon in the armory to help boost activity and inflation? What is for sure, is that the absolute magnitude of the depreciation so far (I personally wouldn’t call this a devaluation, but just semantics perhaps) is small. It reverses less than half of the appreciation against the dollar since 2008. While the broad effective exchange rate is up 30% over that same period. CNY would need to move a lot further for there to be a really meaningful impact on trade and domestic inflation. Of course, you could argue that this change in approach by the PBoC comes at a time when you would expect CNY to be weaker (capital outflows, slower domestic growth, tighter monetary policy expected in the US). And so it may well portend a much more significant weakening in the currency. Indeed, several sell-side shops have already come out saying that they expect a depreciation of around 10% in total over the remainder of this year. But could it be that the PBoC have just cocked-up? It wouldn’t be the first time. Back in the summer of 2013 they squeezed liquidity in the banking system so tight that interbank rates soared. The resulting policy reversal suggested that whatever their intention, things had not quite gone to plan. Could this be the case this time around? Ie could the change be a technical one that is being driven by a desire to be included in the SDR basket, implemented at a bad time and without proper consideration? 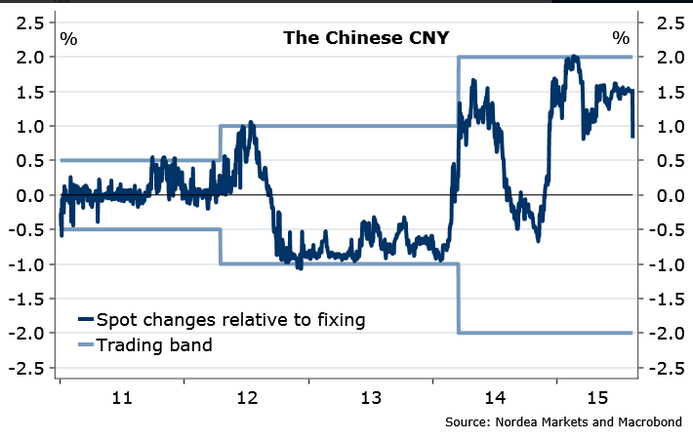 One hint in this direction is the intervention in the FX market in late trading this morning to help support CNY. Again, it looked as though things had gotten away from the PBoC, and they were now trying to beat a hasty retreat. There is definitely the fire-power to support the currency should they wish to do so, and therefore stabilise the CNY spot rate, and alongside it the fixing. Only time will tell, but the next few days will be key. In the meantime, for the first time (in my memory at least), a policy shift by the PBoC has had major global ramifications in FX, FI and equity markets. Fear of the unknown has driven a flight to safety, with US Treasuries and Bunds rallying hard, while global equity markets sink. Asian FX has been hit hard, and so have non-Asia commodity exporters. For those who were already in a precarious situation, such as Brazil, Turkey and South Africa (see here for my recent review of the “Troubled Three”), could this be the trigger to send them into full-blown crisis? Stephen Jen thinks it could well be, suggesting potential declines of 30-50% in BRL and IDR (here). So, as ever with China, there are far more questions than answers. At this stage my money is on them intervening to stabilise CNY and hence the fixing. That should calm markets who currently fear the worst. But I don’t have a lot of confidence in that call. If instead, this is the start of a major policy shift that reflects a far more serious cyclical slowdown in China, then the timing of the first rate hike in the US (and UK) will likely have to be revisited (again! ).